Hi has anyone else noticed since the latest update to 11.3 and 10.13.4 the automatic autofill feature has stopped working. ive noticed websites i go onto automatically used to populate the login details automatically before the update now I have to go onto the website and click the username/email box and then click the autofill option it works but is a more tedious way and doesnt auto populate. any one else noticing this. I've noticed this too. What's perplexing is the fact that while running iOS 11.3 dev beta 6, the autofill function worked flawlessly. Now that I've done a fresh install and set it up as new, it doesn't autofill. It's not a big deal to me because as soon as I tap on a field, the option to autofill is there. Yeah but if it’s for privacy or security reasons, it’s not a bad thing. An option to enable/disable this would have been helpful, but just something else to get used to. Have you tried deleting a conversation in messages since the update? There’s an extra step there too. Yeah not sure why it was pulled exactly, but must have still been too buggy. Not sure if it’s leftover or if they decided it’s not a bad idea to keep the confirmation in general just in case you really didn’t mean to delete the conversation. Time will tell. It’s going to be great for sure once it’s ready to go live permanently! Here is how to fill in passwords and user name. Hit on either user name or password blank. Then you will see thw word password onto of the keyboard like in this photograph. 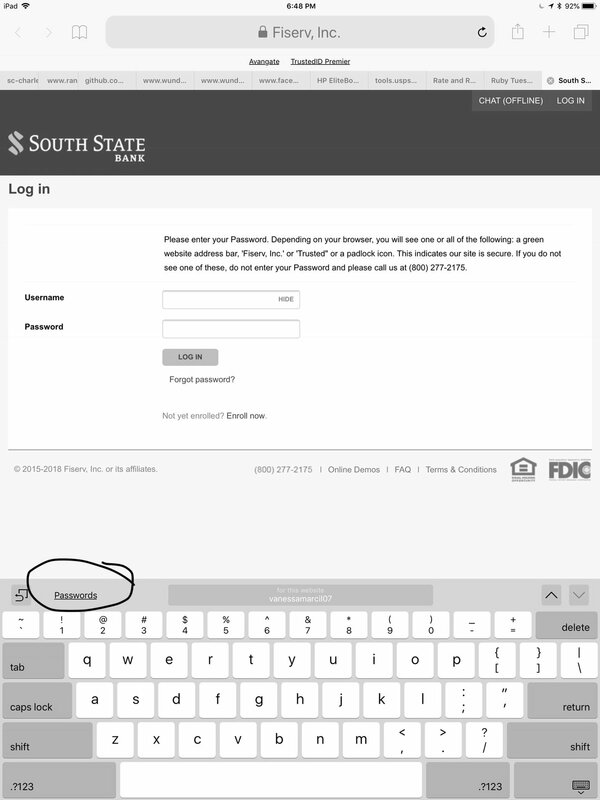 Hit on that there is your fill in password and user name option. That isn’t appearing on mine when trying to log into my Google account, but I have an attached Apple iPad keyboard. it should at least give me the passwords prompt as it does on my iPhone so that I can look up a username/password pair to use with it. That is one thing Apple can improve on - associate many URL’s to a single login. Many sites have different URL’s where they ask you for the same credentials - eg. Google - it would make sense to say - hey Apple keychain, all of the URLs use the same credentials, so lets just keep and manage a single copy and not 30 copies of the same thing, shall we?